The Genesis will be able to carry over 5,400 passengers. The Genesis of the Seas will be the largest cruise ship ever built. The shipyard where construction will be carried out will be similar to this. The ship will be environmentally friendly using much less fuel than previous cruise ships. There will be a Royal Promenade bigger than any seen before. The luxury state rooms will have state-of-the-art technology and also be the height of luxury and comfort. Royal Caribbean International (RCI) has commissioned an entirely new class of cruise vessel which will set the mark for large passenger vessels for years to come. The new design is called the Genesis Class and will have a gross tonnage in excess of 220,000t. The first of the new class is expected to enter service in the final quarter of 2009. The ship will have a passenger capacity of over 5,400 (total capacity could be up to 6,400) and is expected to cost a total of $1.24bn for construction and fit out, making it the world’s largest and most expensive cruise ship. The company estimates the all-in cost of the ship to be approximately $230,000 per berth. The Genesis Class will surpass the previous Freedom Class (also an RCI marque) as the world’s largest passenger ships. They will be 21m (61ft) longer, 8.5m (29ft) wider, have a slightly deeper draft than the Freedom Class ships, and a gross tonnage that is expected to be 43% greater. 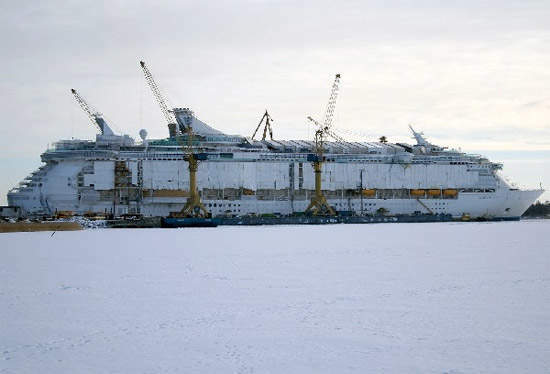 The building contract, worth about €900m ($1bn), was awarded to the Norway-based shipbuilder Aker Yards in March 2006. Aker said it would be “the most valuable ship ever ordered in the history of commercial shipbuilding”. The first new ship of the Genesis Class, which has not yet received a name, although rumours abound that the name of the first will be ‘Genesis of the Seas’, will be 1,180ft (360m) long, 154ft (47m) wide (beam) at water level and 240ft (65m) high, with a displacement of approximately 100,000t and a draft of 30ft (9+m). Aker has said that the contract is contingent on final approval of financing and the ship will be built at one of the Finnish yards. The order means 5,800 man years of work for the yard. Aker Yards Cabins, which until 2007’s name change was known as Piikkio Works, will construct the cabin modules for the new Genesis project as pre-fabs, which are then shipped to the Aker yard where the ship will be constructed and outfitted. Aker Yards Cabins already has prototypes of the cabins for Genesis but they are being kept away from prying eyes. The majority of the cabins will be installed as modules but some of the larger staterooms have to be constructed in situ. One of the most important priorities for the new design is energy efficiency and the minimisation of waste to make the ship as environmentally compatible as possible. 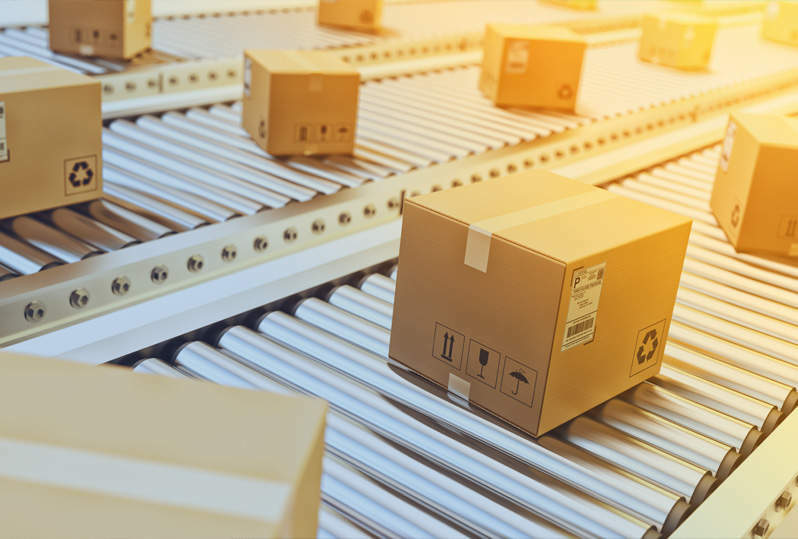 This required significant modifications to be made to the form of the hull and in the air conditioning and water production and treatment systems. In September 2006 KONE was granted a contract for the design, supply and installation of all the elevators on the new Genesis Class ship. The contract includes a total of 41 customised elevators, which will be hoisted by KONE EcoDisc machinery and based on either the KONE MiniSpace or the machine-room-less KONE MonoSpace platform. Delivery of the elevators is scheduled for the third quarter of 2009. Royal Caribbean also has an option for a second ship in the same class, which would be ready by 2010. Richard D. Fain, the Chairman and CEO of the parent company Royal Caribbean Cruise Ltd, said: “It is exhilarating to take such a giant step into the future, we are fortunate to have such gifted collaborators as Aker Yards, and such valued supporters and advisors as our guests and trade partners. The Genesis Class ship will include a myriad of new features and bring together all the best innovations and facilities from all of the other Royal Caribbean vessels. 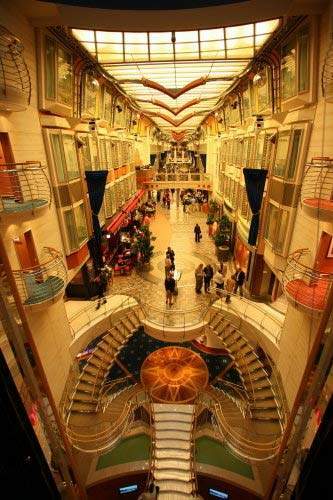 The ship is projected to have new features such as a bowling alley complex, a billiards lounge (with innovative self-levelling tables) similar to those found of the Radiance Class Ships, a series of larger dining rooms, and an extended Royal Promenade shopping and recreation area featuring pubs, shops, arcades and bars. Much larger state rooms and balcony areas will also be included on the ship and also a larger variety of dining, bar, lounge and entertainment options. There will be an interactive water park and sun deck (H2O ZONE), a dedicated adult pool and the main pool and also two whirlpools in a similar fashion to the Freedom vessels. There will also be a sports area with a rock climbing wall, the FlowRider surf park (an onboard wave generator for surfing), a miniature golf course and a full-size basketball court. Other sporting and health facilities will include an ice skating rink, a full-size boxing ring, a fully equipped Nautilus gym and a state-of-the-art spa offering a full range of the latest treatments. 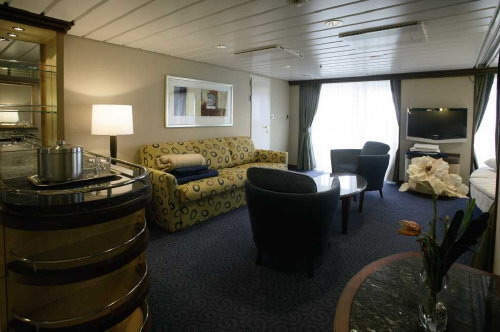 The ship will have a larger casino, Wi-Fi access across the ship, flat panel LCD televisions in all staterooms and seamless mobile phone connectivity.